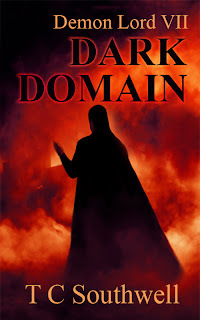 I'm happy to announce that Demon Lord VII - Dark Domain, has been published at Smashwords and Amazon. It will become available at all the other retailers, such as Barnes & Noble, Sony, Kobo and Apple within a couple of weeks, when it is distributed by Smashwords. I struggled with this book due to all the unfortunate distractions and accompanying emotional turmoil, but now that the worst is past I intend to continue with Book VIII, as yet untitled. I have scrapped the When Angels Fall title because it has been used rather a lot by other authors. Thanks for your support, patience and well wishes, and I hope you all enjoy the book! Buy it here. The Demon Lord must face three dark gods, possibly four, in order to keep the child goddess Kayos has awakened safe. At the same time, he is beset by the people whose domain Sherinias now rules, who do not believe in gods. They know all about evil, and have been trying to fight it for centuries, with dire consequences. Their attempts hamper Bane, however, and place him in additional danger. While most try to kill or capture him, others are persuaded that Bane is not a destroyer and take his side. Sherinias’ world is still in a great deal of trouble, falling into darkness as its people destroy it with their careless plunder, and not even Kayos can save it. The city the people have built in the God Realm just outside the realm gate makes it difficult to close the portal, which they strive to keep open, but if it is not closed all manner of gods may enter and put this dark domain and its child goddess in even greater peril…. Bane followed the path past the gazebo, heading for the gate hall. The soft, slow chimes continued, louder now that they approached the source. The gate hall came into view, its massive, diamond-encrusted pillars swallowed by mist high above. Bane stopped beside a bank of cloud bushes and studied the hall, within whose dimness glowing runes pulsed around the giant gateway. A flying vehicle hummed overhead, apparently oblivious to the gate’s alarm, but then, it remained open. A flicker caught his eye, and he stared at it. It moved, becoming discernible as a man-shaped figure with sweeping horns and a bull-like head. A second figure appeared beside it, as if stepping from another dimension, as angels did. Four shadows twisted and swirled beyond them. All six skirted on the edge of his vision, barely perceptible. Mirra released his hand and backed away. One of the entities vanished and reappeared right in front of Bane, becoming entirely visible. Curved horns swept from the brow of what appeared to be a muscular, seven-foot-tall man clad in polished, spiked steel armour over a tattered dark grey kilt, his face partially obscured by a bull-faced helm. The second creature appeared beside the first, this one wearing a spiked helm and scale mail over ragged brown trousers. He had a massive broadsword strapped across his back, and the first carried a spiked club. They peered at Bane with ink-black eyes, which flicked past him to Mirra. “Ha! Sport!” the bull-helmed man shouted. Two of the shadows beyond them shot towards Bane, becoming recognisable. Hellhounds. Bane flung himself at them as they streaked past, seizing one. He rolled with it in the clouds, the demon beast growling as his hands locked around its throat. It was impossible to strangle something that did not breathe, however, and he could not destroy a hound without his power. A scream from the clouds where Mirra had fled turned his heart to fire, and he gripped the Hellhound’s head and twisted, ripping it off. Leaping up, he sprang after the other beast, but something struck him from behind, sending him rolling into the mist. Mirra screamed again, and Bane raised his head, his skull ringing and lights dancing in his eyes. The hound circled her, its eyes aglow, teeth bared, savouring its kill for the benefit of its masters. Kayos appeared beside Mirra, swept her up and vanished, leaving the Hellhound snapping at air. Bane slumped, clasping his pounding head, then became aware of the two beings who stood behind him, watching him. He turned, frowning. Drevarin appeared in the clouds off to his left, striding closer, but he stopped several yards away, looking uncertain. Bane studied the man-shaped creatures, but he had no idea what they were. The Hellhound whose head he had torn off grew a new one, stood up and returned to its masters, as did the other one.